As track and field season gets in full gear, track and field meet schedule is shaping up pretty fast this year. 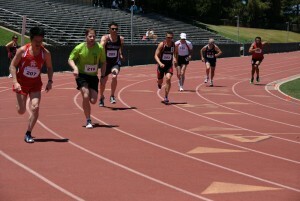 Most of us are focused on Gay Games this year, but there will be plenty of local, regional and national track and field meets before then, and those are great places to practice your event strategies (pacing, block start, etc. ), conditioning (diet, rest, etc.) and preparation (equipments, packing, warming up, etc.). So, here are some of the track and field meets we’ve competed in the past and their schedule for 2014. Mostly local San Francisco Bay Area meets, but there are a few that are outside Bay Area. Our own Pride Track & Field Meet is not included below. As soon as we finalize the plan, we will keep you all posted. Above meets have been entered into our Event calendar. New feature on our website! You can now leave a comment in our News post (like I am doing right now) and have it broadcast in your Facebook News feed automatically. This way, your friends will see your comment in the post and get their attention to our website. Cool? I hope so!